These are a couple of books from Malaysia which I read for the Read The World challenge, both picked because I thought they would make a change compared to some of what I read for the challenge. For a start, they’re both contemporary works, rather than the 20, 30, 40 year old books I often end up reading. And 21 Immortals: Inspector Mislan and the Yee Sang Murders is a crime novel, while Ripples and other stories is, obviously, a books of short stories. 21 Immortals was a silly choice, really. Not because of the book itself, which is fine I guess, but because I have never understood the appeal of crime fiction (or indeed the even more depressing genre, ‘true crime’). I’m just not very interested in the grisly murders themselves or the police procedural/CSI stuff. The Malaysian setting gave it some novelty value, but otherwise it was a pretty standard example of the genre and so it largely left me cold. Ripples is more my usual thing: more ‘literary’, anyway. The stories are interlinked, each picking up some detail or character from the story before, and they are surprisingly varied in style: some are low key stories about the details of everyday life, others have more overtly dramatic subjects or are fantastical tales. Not all of them are equally successful, but there was plenty here to keep me reading, at least. At least with short stories, if you don’t like one much, there’s always another one along in a minute. And if this review seems a bit vague and non-commital: well, the truth is that it has been a few days since I finished Ripples; and although I quite liked it while I was reading it, it didn’t leave a profound impression. So, slightly underwhelming choices for Malaysia, but hey-ho, on to the next thing. 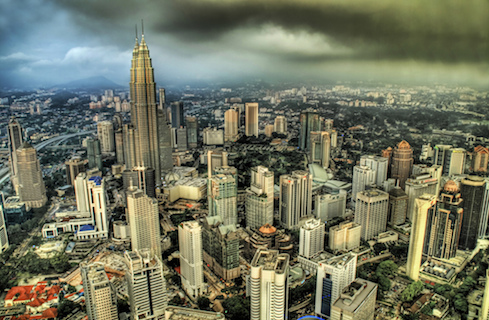 » ‘Summer Storm over Kuala Lumpur’ is © Trey Ratcliff and used under a CC by-nc-sa licence.